Through their multiple programs and expansive reach across the state, Utah Food Bank has seen a decline in the number of Utahns facing hunger on an annual basis and an increase in stable access to food among school-age children. A healthy diet and proper nutrition are critical for the growth and development of children. 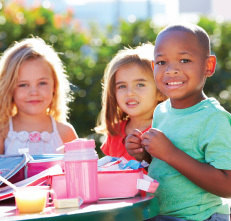 Lower dietary quality and undernutrition can negatively affect overall health, cognitive development, and school performance.1 Lower dietary quality and undernutrition can be caused by food insecurity, which is defined by the Dietary Guidelines for America as “the limited or uncertain availability of nutritionally adequate and safe foods or uncertain ability to acquire acceptable foods in socially acceptable ways.”2 In 2014, 15.4% of people living in the United States experienced food insecurity.3 In Utah, 14.2% of people experienced food insecurity rate in 2014.4 Additionally, in Utah alone, 1 in 5 children are unsure where their next meal will come from.5 Ensuring all children have access to food and a healthy diet is important for their development, including in the classroom. Utah Food Bank has been fighting hunger statewide for over 100 years and has implemented various programs that address food insecurity and hunger among children. Specifically, Kids Cafe, the BackPack Program, and the Mobile School Pantry Program are initiatives Utah Food Bank implements to ensure children are not hungry during the school day or at home. Kids Cafe, which began in 2001, provides nutritious meals for children across 42 after-school sites, where 50% or more of the participants receive free or reduced-cost breakfasts and lunches at school. The program also includes after-school sites at elementary schools, community centers, and after-school programs around Salt Lake County.6 The BackPack Program, which is a nationally recognized program by Feeding America, provides participating children with a backpack containing easy-to-prepare food to help sustain them through the weekend when they don’t have access to school meal programs.7 Lastly, the Mobile School Pantry Program, which selects schools based on the percentage of students who qualify for free or reduced-cost lunch, started as a pilot program in one school during the 2012–2013 school year, serving 313 students and impacting a total of 226 households.8 Once a month, at a pre-determined date and time, Utah Food Bank staff and corporate volunteers distribute food and other items, such as diapers and hygiene products, to students to bring home to their families. During the 2015–2016 school year, the Mobile School Pantry Program was operating in 33 schools. Through their multiple programs and expansive reach across the state, Utah Food Bank has seen a decline in the number of Utahns facing hunger on an annual basis and an increase in stable access to food among school-age children.8 During Utah Food Bank’s 2015 fiscal year, Kids Cafe provided more than 283,000 meals to children across the state. In the same year, Utah Food Bank delivered nearly 64,000 backpacks through the BackPack Program over the course of the school year at 35 sites across the state.7 Through the Mobile School Pantry Program, Utah Food Bank served 29,056 households and 148,995 clients and provided 643,165 pounds of food during the 2015–2016 school year. Of those clients, 81,981 were under the age of 18. Additionally, teachers and parents from the Mobile School Pantry Program schools noted improved behavior and attention among participating students, which are important factors contributing to academic success.9 During the 2016–2017 school year, Utah Food Bank will continue to implement the Kids Cafe and BackPack Programs and expand the Mobile School Pantry Program to 56 schools across Utah. Not only have these programs provided thousands of meals to Utah children who might otherwise have gone hungry, but they have contributed to limiting the negative consequences associated with hunger that impact children both in school and at home.